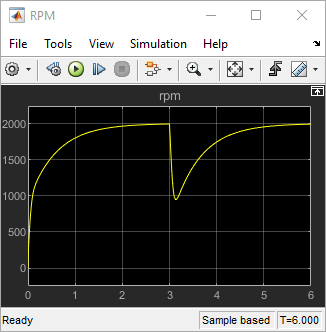 This example shows how to use slTuner and systune to tune the current and velocity loops in a linear electric actuator with saturation limits. The electrical and mechanical components are modeled using Simscape Electrical and Simscape Multibody. The control system consists of two cascaded feedback loops controlling the driving current and angular speed of the DC motor. Figure 1: Current and Speed Controllers. Note that the inner-loop (current) controller is a proportional gain while the outer-loop (speed) controller has proportional and integral actions. The output of both controllers is limited to plus/minus 5. We need to tune the proportional and integral gains to respond to a 2000 rpm speed demand in about 0.1 seconds with minimum overshoot. The initial gain settings in the model are P=50 and PI(s)=0.2+0.1/s and the corresponding response is shown in Figure 2. This response is too slow and too sensitive to load disturbances. You can use systune to jointly tune both feedback loops. To set up the design, create an instance of the slTuner interface with the list of tuned blocks. All blocks and signals are specified by their names in the model. The model is linearized at t=0.5 to avoid discontinuities in some derivatives at t=0. The response looks good in the linear domain so push the tuned gain values to Simulink and further validate the design in the nonlinear model. The nonlinear simulation results appear in Figure 3. The nonlinear behavior is far worse than the linear approximation, a discrepancy that can be traced to saturations in the inner loop (see Figure 4). 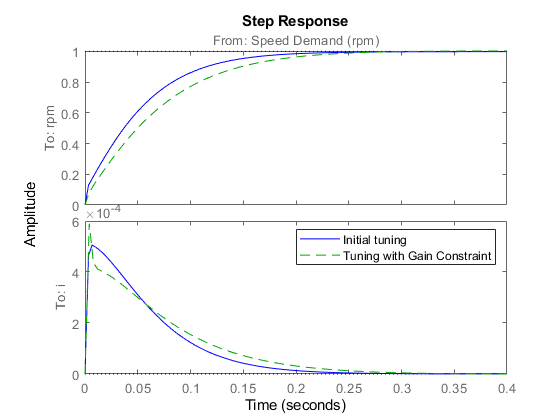 Figure 3: Nonlinear Simulation of Tuned Controller. Figure 4: Current Controller Output (limited to plus/minus 5). 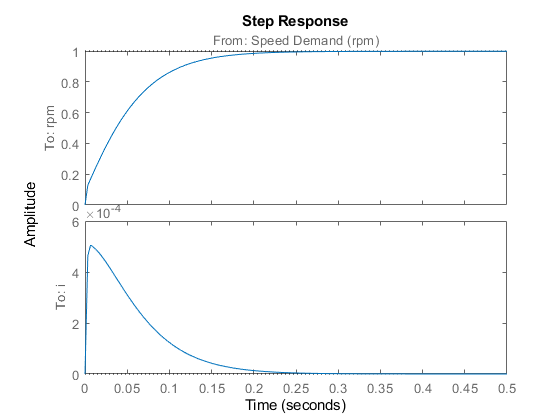 So far we have only specified a desired response time for the outer (speed) loop. This leaves systune free to allocate the control effort between the inner and outer loops. Saturations in the inner loop suggest that the proportional gain is too high and that some rebalancing is needed. One possible remedy is to explicitly limit the gain from the speed command to the outputs of the P and PI controllers. For a speed reference of 2000 rpm and saturation limits of plus/minus 5, the average gain should not exceed 5/2000 = 0.0025. 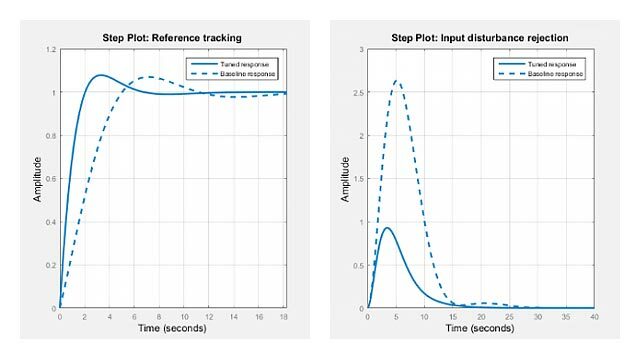 To be conservative, we can try to keep the gain from speed reference to controller outputs below 0.001. To do this, add two gain requirements and retune the controller gains with all three requirements in place. The final gain 1.39 indicates that the requirements are nearly but not exactly met (all requirements are met when the final gain is less than 1). Use viewGoal to inspect how the tuned controllers fare against each requirement. Next compare the two designs in the linear domain. The second design is less aggressive but still meets the response time requirement. Finally, push the new tuned gain values to the Simulink model and simulate the response to a 2000 rpm speed demand and 500 N load disturbance. The simulation results appear in Figure 5 and the current controller output is shown in Figure 6. 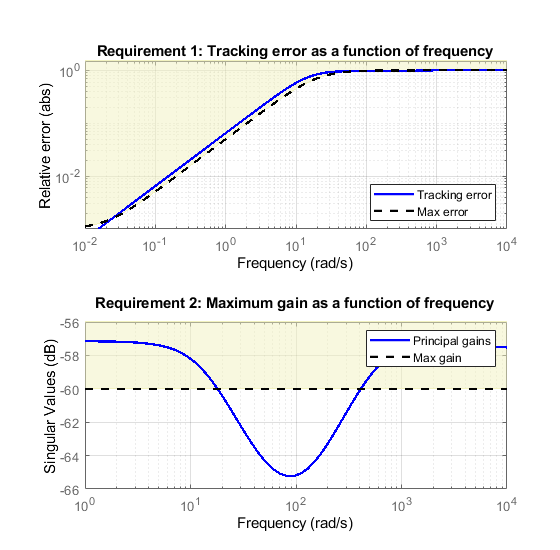 Figure 5: Nonlinear Response of Tuning with Gain Constraints. Figure 6: Current Controller Output. The nonlinear responses are now satisfactory and the current loop is no longer saturating. The additional gain constraints have forced systune to re-distribute the control effort between the inner and outer loops so as to avoid saturation.